Science remains in the dark as to the matters that make life most worth living. It has been left to music and art to express human ideas about joy, happiness and our inner reality. 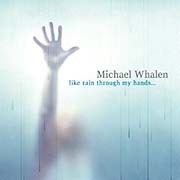 Like Rain Through My Hands (53'55") is Michael Whalen's celebration of the sensory wonder found in melody and form. His innovative open arrangements are enduring and endearing in their consistency. These seven swirling ambient fantasies are affirming and range from the tender and somber to the sparkling and luminal. Even during this album's most amorphous sections, it is never without direction. Piano melodies warm the room against the icy harmonies of Whalen's digital synth chords. Electronic pads breathe deeply beneath breezy themes. With its shifting chords and a fluctuating tonality, Like Rain Through My Hands guides the listener towards points along its emotional arc... to this album's metaphoric connection between grasping at raindrops and capturing lost moments in time.